The Richway Mini Biomat is the smallest member of the Biomat family. It is also the most flexible so you can use it just about everywhere. Its lighter than the other Biomats, comes in a carrying case with a shoulder strap and so is the perfect portable version of the Biomat. Throw it on the couch or on the living room floor and watch your kids and pets gravitate towards it. Take it in the car and to the office. Its versatility is its standout quality. Also, there is another added benefit for professional healers. Add it to your repitoire of healing aids, use it with your customers and even add it to your sessions as an added value service. Biomats are great for any healing professional to use in their practice. Some professionals find that they can use the Biomat as a value added service for their customers. Some use the Mini Biomat in conjunction with the Professional size, having their customers lay on the Professional and then applying the Mini on top of the person in problem areas. This "sandwich" use of the Biomats can get your customers infrared therapy from both sides and has been proven to be very effective. 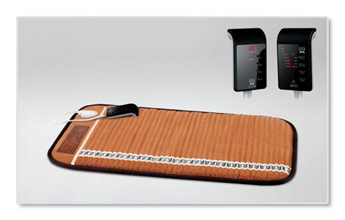 Your customers will inevitably want a Biomat for their homes so many healers have become distributors of the Biomat as well. The Mini Biomat Controller is touch screen and is manufactured by Texas Instruments, America's oldest electronics manufacturer.